Out of all the characters in Warner Bros.' upcoming Suicide Squad, Harley Quinn (Margot Robbie) might have the most interesting history. While most of these characters are rooted in the DC Comics, Harley Quinn was actually created for the 1990s TV series Batman: The Animated Series, before transitioning into the comics. Today we have new photos that reveal our first look at one of this character's most iconic outfits, along with a different nightclub/stripper look we haven't seen before. Earlier today, a B-roll video surfaced that was eventually removed, but images still surfaced from this behind-the-scenes sneak peek that features our first look at Harley Quinn's jester outfit. 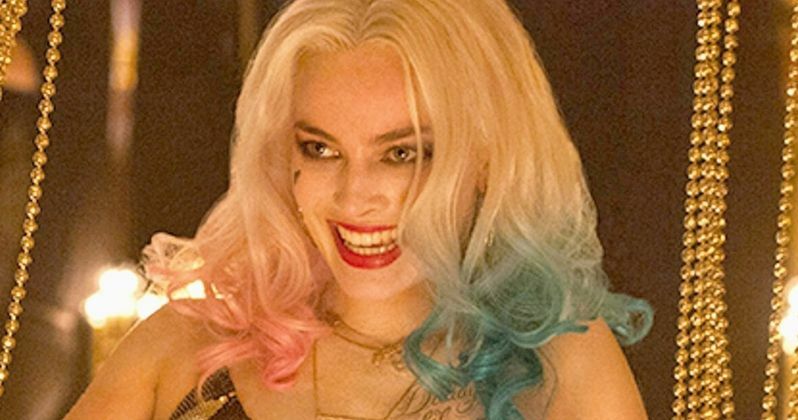 The first photo features Margot Robbie holding up this outfit, while the second is a behind-the-scenes shot with director David Ayer and Jared Leto, where the costume is on display via a mannequin. We don't know for sure yet if Harley will actually wear this costume in the movie, though. If that wasn't enough, Empire also has another photo of Harley looking a bit more glamorous, all dressed up for a night out on the town, presumably with The Joker (Jared Leto). The site also spoke with producer Charles Roven about the proposed Harley Quinn spinoff, which we first reported on a few months ago, that may also include Batgirl and the Birds of Prey. The producer would only say that this project is "at a very nascent stage," so we'll have to wait and see if there are more updates after Suicide Squad hits theaters. In Suicide Squad, when Midway City is threatened by a powerful mystical enemy, Amanda Waller's plan to unite the baddest of the bad gets the go-ahead. She cuts deals with a whole squad of prisoners: Deadshot (Will Smith) gets his Second Amendment rights ­reinstated, Harley (Margot Robbie) is set free from her cage, Diablo (Jay ­Hernandez) steps out of his fireproof prison, Boomerang (Jai Courtney) and Slipknot (Adam Beach) each get to wield their signature weapons once more, and Killer Croc ­(Adewale Akinnuoye-­Agbaje) emerges from the swamp. The only condition is this: Obey orders or die. This is strictly enforced by squad leader Rick Flag (Joel Kinnaman), the samurai Katana (Karen Fukuhara), and of course the explosive devices - developed by Wayne Enterprises - inserted into their necks. However, the arrival of the tatted-up Gotham City mega-criminal, the Joker (Jared Leto), might doom the mission thanks to his plan to reunite with his true love, Harley. In related news, Jared Leto also shared a new image of The Joker on Instagram which you can check out below. Box office analysts have been predicting that Suicide Squad could earn upwards of $125 million when it hits theaters on August 5, but we'll have to wait and see. While we wait for more on this highly-anticipated comic book adaptation, check out the new photos below.